Move over Cobb salad, there is a new bowl of mixed greens in town. While many of the ingredients are the same (it is okay to skip the eggs! ), you’ll quickly note that the vinaigrette is different. It has a more grown up flavor, and we are sure that you will love it, and dive into it, just as soon as it is prepared to perfection. As far as vinaigrettes go, you can whip them up after the meat portion is done cooking, drizzle it over the salad and quickly get on with the eating. This is a totally acceptable “dressing” practice. However, with a little advance planning, you can make it an hour ahead of time, letting it sit on the counter, for all the flavors to meld into each other. For the best vinaigrette results, you will also want to have all ingredients at room temperature before starting, that way the oil, vinegar and lemon juice all have the same starting point, and they can work together in bringing about a beautiful emulsion. 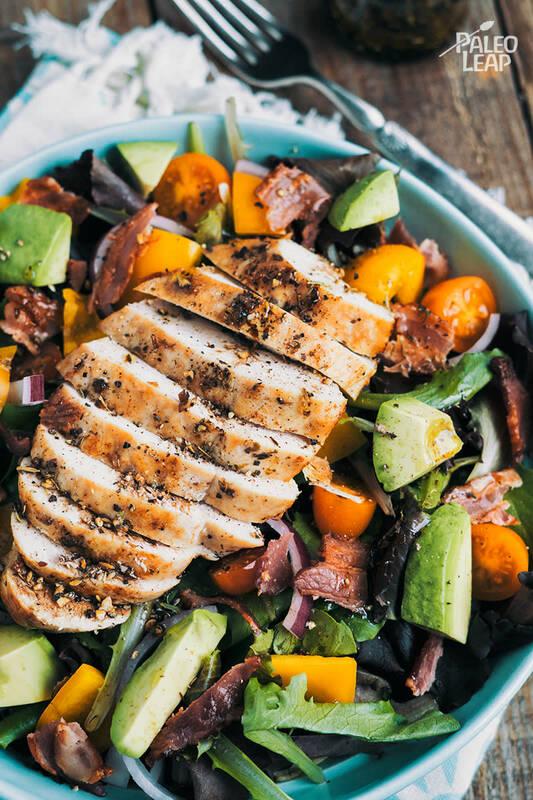 This balsamic chicken salad is exquisite just as it is, absolutely nothing to change here! Nothing to add, nothing to lose. But this hearty dose of protein and vegetables may just stimulate your appetite enough for a dessert of greater proportions, so make sure to have a bunch of essential Paleo baking ingredients on hand (almond flour, coconut flour, raw honey, coconut cream, etc.) so that when a certain kind of sweetness should follow, you are quick to whip up a Paleo carrot cake. Sharing required. Season the chicken with oregano, onion flakes, garlic, paprika, sea salt, and black pepper. Heat cooking fat over medium-high heat. Sear chicken breasts in the skillet. And cook until no longer pink, 6 to 8 minutes per side, and let rest 4 to 5 minutes. Slice the chicken breast, and set aside. In a bowl combine all the ingredients for the balsamic dressing, and whisk until well emulsified. In a salad bowl combine the mixed greens, bell pepper, grape tomatoes, red onion, and avocado. Top with chicken and bacon, and drizzle the dressing over the salad. Give everything a gentle toss and serve.